Emergency personnel, vehicles and lighting equipment are shown above surrounding a pond Monday morning on the Huntersville Road, near where the body of Casey Burchett was discovered. The pond was drained Sunday after her vehicle was spotted in the water. Below, the Pontiac Burchett was driving can be seen as it was lifted from the water by a boom wrecker on Sunday, as the search for Burchett first began. A tragic accident that occured either late Saturday night or early Sunday morning has claimed the life of a young Clinton County woman. The body of Casey Burchett, 24, of Albany was found dead Monday morning after more than 24 hours of searching in the Huntersville Community. The call reporting the discovery of Burchett’s body was made to the Clinton County Dispatch Center just before 9:00 a.m. Monday. Deputy Coroner and EMS Director Lonnie Scott said he pronounced the death of Burchett at 9:15 Monday morning, January 30. The orginal call was made by Ronnie Cowan Sunday morning after he had spotted a portion of the car above the water in a pond. 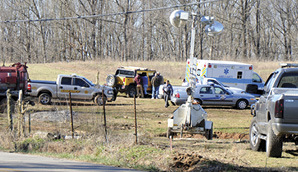 The scene of the accident was on the Huntersville Road, about a mile west of the intersection with U.S. 127 in southern Clinton County, about four miles south of Albany. When officials arrived on the scene Sunday morning, a car was almost completely submerged in the pond according to Clinton County Sheriff Rick Riddle. Riddle said the bumper of the vehicle came off before it entered the pond. After a licensing plate check, Riddle then confirmed the vehicle belonged to Burchett. Burchett was driving a red 2001 Pontiac Grand Am when the vehicle left the roadway, traveled through a fence and into a pond. The pond was situated just a few yards from the road. Riddle said he guessed the pond to be 200 feet wide by 200 feet long and could have been 15 feet deep in the deepest part. The vehicle, however, didn’t make it to the center of the pond, but instead stopped several feet from the edge of the water. 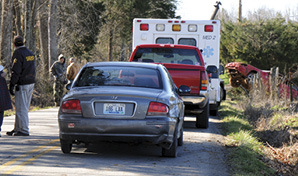 The vehicle was found on Donald and Welby Neal’s farm. Riddle said he doesn’t suspect foul play to be involved. It is suspected Burchett died of hypothermia, but cause of death won’t be known until an autopsy is performed. The temperature reached a recorded low that night of just above 20 degrees. According to a press release issued by the Kentucky State Police Monday, the investigation is ongoing and an autopsy was to be performed in Frankfort. “We performed an immediate search of the woods and even some of the family was down there searching, but then they started doing a wider search once the pond was drained,” Riddle said. “The state police is handling the investigation,” Riddle said. Also on the scene was the Albany Fire Department, Clinton County EMS, several local volunteers offering help and the Pickett County Sheriff’s Department. A complete death notice for Casey Burchett will appear in next week’s Clinton County News.